Assessing Culture – Is It Seriously Ill? HomeBlogCorporate CultureCulture AssessmentAssessing Culture – Is It Seriously Ill? 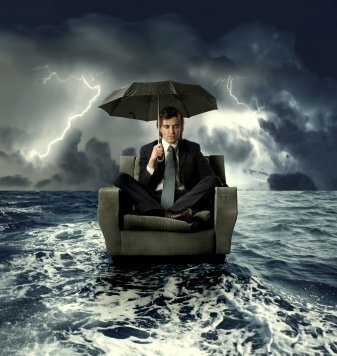 As if they’ve been cast out in a boat on a stormy sea, leaders are usually oblivious to the fact they’ve spawned a corporate culture that is unhealthy and filled with disease, until it’s literally on its deathbed or in triage. Cultures like this have a lot of happy talk but lack clear focus, are filled with unhappy employees who are “biding their time” until they can jump ship, and are plagued by constant political game-playing, diverting attention from the real issues of the day – how to adapt, compete, and evolve. Unfortunately, this situation is all too common. Right Management reported in November 2009 that 60% of people plan to leave their job in 2010. If you are leading in any capacity, heed this giant wake-up call. Unless you’ve actively worked to build a great workplace, you are not immune. Below are brief snapshots of four of the most common cultures we find that derail performance. These are the places that are ripe for real culture change. If this is going on in a company you lead, maybe you’re not to blame, but you are responsible. Download full descriptions with “key remedies” for each culture type here. Characteristic of regulated, slow-to-change or “we’re the expert” industries (e.g., healthcare, airlines, legal), where dependability and quality on “having the answer” are top priority. This classic “we controlled our market” company loves procedure, formalized work structures, coordination, and organization. Often they have been subsidized by regulatory protection. They may have a clear vision, values, and identity, but it’s very unlikely that’s dialed into the customer point of view. Process is king; cost cutting is a favorite strategy. Example: The Government. Need we say more? This culture resembles an ant colony: Swarm today, gone tomorrow. Usually characteristic of volatile, fast-shifting industries (eg, technology), they live and die by short-term focus (eg, the Street’s quarterly report). The place is high-energy, dynamic, people take risks, and experimenting and creativity are encouraged. Everything is about winning: “We turn on a dime 20 times an hour.” Value placed on having the cool new product and being on the leading edge. Sales, market share, and market penetration are king, but consistency in the support and service end of the business may falter. As the organization grows, the constant change competes with a platform of reliable quality and stability, and people feel they are in a continuous shell game: As soon as you figure out the rules and priorities, they change. (often, the priorities were never clear to begin with). Revenues grow but the organization struggles to sustain profit and build a solid and consistent brand identity over time. Employee burnout and turnover are common. Example: Many technology companies struggle to evolve this culture into one that can execute a consistent brand promise. In an “authority without influence” culture, leaders overplay their power and as a result (sometimes unwittingly), dis-empower everyone else. This results in diminished buy-in or engagement to change. Progress is not the result of felt need, it is mandated by edict. Nobody really accepts accountability, they just wait for someone else to decide or act, and decisions are regularly escalated up and across the chain. The most visible symptom is a lack of personal responsibility throughout the company. Change efforts don’t have buy-in, only compliance. Employees feel they must “tow the line” or face punishment. This strong culture resembles the classic “parent/child” syndrome and authority, responsibility, and accountability are a finger-pointing activity. It is often the result of a legacy of a powerful entrepreneur who made the place famous. Or maybe the place is run by golden-oldies or “good-ole-boy” networks who have been in power forever. There is strong loyalty and camaraderie, but people don’t speak the truth for fear of retaliation by the “old guard” who support the dominant culture. Examples: Enron is an extreme example. A lot of large legacy companies experience a less dramatic version of this pattern. In a “we’re so nice” culture, truth is a death sentence. We are polite, politically correct, and tell the truth as long as it’s what someone wants to hear. Even though people are deeply concerned about problems with customers, products, or quality – progress to fix them at the root is rare because it is not safe to surface the root issues, let alone discuss them or talk about an alternative strategy. Often, people have been fired or punished for attempts to speak up. This results in organizational schizophrenia in which people nod, smile, and agree – but often do not follow through. People talk about “loving” the boss but they often don’t trust him or her – there is open criticism behind people’s backs, and the undertone of fear permeates. Risks or new methods are avoided – “They won’t let us _________” and an almost paranoid sense that “big brother is watching.” Decisions are regularly escalated up and across the chain. People hide bad news and their true opinions from their leaders – who are often shocked (and indeed some say “betrayed”) when they discover how people really feel. This culture suffers from lack of personal responsibility throughout the company – finger-pointing has reached an art form. Favorite mantra: Silence. Often the leader is the only one talking. 1. Getting everyone excited about a compelling mission/goal that answers the questions WHY? (why do we serve this customer, why are we doing this, why should I care?). 4. Get feedback systems in place that allow people to tell the truth, see reality and tune into the market. Cultures can change quickly through small, steady pulls on the right levers. The first step is seeing the problem clearly.